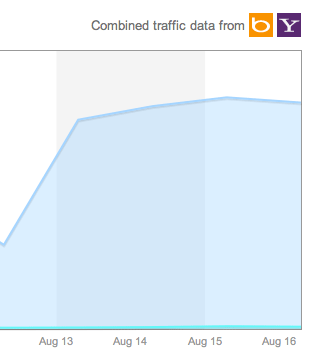 Home > Bing > Bing SEO > See A Spike In Bing Traffic Within Webmaster Tools? Here Is Why. Login to your Bing Webmaster Tools and click on a traffic report, you may notice a spike of twice as much traffic being report from August 13th on. I do. The reason is because Bing has now incorporated Yahoo traffic and other data directly into the Bing Webmaster Tools. Just an heads up on this, there has not been much discussion around this news except for at WebmasterWorld.